For the third straight year, O-Pee-Chee featured a separate set of hockey cards showcasing players from the rival World Hockey Association. 1976-77 O-Pee-Chee WHA Hockey retains the 132-card size and introduced a new subset. Clearly, the league seemed to be doing well enough to mix it up a little bit. Card fronts feature a player picture, with the border forming a frame that morphed into hockey-specific design features. A banner at the bottom left contains the player's name and team, while a hockey-stick shaped image at the bottom right has his position. The team logo is placed in the lower right corner. 1976-77 O-Pee-Chee WHA Hockey backs are oriented vertically, with most of the information placed into oval-shaped areas. The top oval contains a biography in English. Beneath that is an oval that shows the card number, with a brown bar extending across the card and giving the player's name. An oval below that has his vital stats along with the past year/lifetime statistic line. Finally, the last oval-shaped area has a French translation of the biography on the top. Cards 1 through 6 feature the previous season's leaders in several categories, the only time a WHA set would include that. 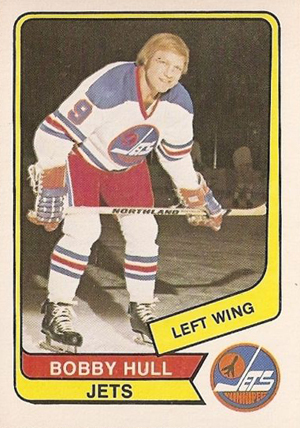 1976-77 O-Pee-Chee WHA Hockey has one checklist card, as well as an All-Star subset that ran from cards 61 through 72. The All-Star cards had puzzle backs that formed a picture of either Gordie Howe or Bobby Hull. Surprisingly, there are no notable rookies. Helpful but still missing a few things. 1975 OPC WHA #75 MARTY HOWE (RC) SGC 96 MINT 9 Hou AEROS O-PEE-CHEE CENTERED!